D'Angelo And Questlove Bare The Roots Of 'Voodoo' : The Record For D'Angelo's disciples, Monday night was a chance to see an artist defined by distance and mystery up close. 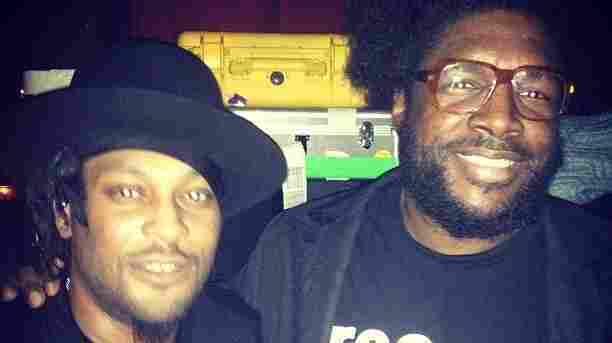 D'Angelo and Questlove on Monday night at Brooklyn Bowl. Say you fell in love with D'Angelo's Voodoo in 2006 — six years after it was released. The hype over "Untitled (How Does It Feel?)" had long since dissipated, and media inquiries about his status reached an all-time low. The man wasn't exactly keeping the hearth alive — he'd been late with album releases like Dr. Dre and quiet in the fallow times like Mark Hollis. To you, Voodoo was an album disembodied. "Woman's Gotta Have It" (Bobby Womack) / "The Line"
"New Position" (Prince) into "Africa"
And then Monday night happened. D'Angelo — the mythical neo-soul auteur who, after over a decade of radio silence, resumed infrequent touring a year ago — played a two-man show with his extremely patient collaborator and confidant Questlove at Williamsburg's Brooklyn Bowl. For D'Angelo's disciples, the show was a chance to see an artist defined by distance and mystery up close and personal. The 600-capacity venue was a more than suitable cathedral for a performance from the man once dubbed "R&B Jesus." D'Angelo's recent shows were at places like the Superdome or Jay-Z's star-studded Made In America festival. But at Brooklyn Bowl, audience members breathed the same air as someone many of us thought would never reappear. We were close enough to catch his nervous smile when he and Questlove debated playing "Lady" as an unrehearsed encore. Close enough to watch Questlove drop overt "One more chorus!" signals and guide a song over choreographed time changes and tightrope-walker hits. Close enough to watch D'Angelo's left hand lay its claim for the title of best bassist alive. Some were even close enough to catch a very sincere handshake from D as he exited the stage. In attendance were a first anxious, then rapturous assembly of devotees — down-from-day-one fans who celebrated Brown Sugar on its release, younger folks who discovered Voodoo too late (they thought), music writers, people in the business. There were musicians accomplished in their own right, like Derek Trucks and Soulive/Lettuce's Eric Krasno who view D'Angelo as an almost foundational figure, and vanguards of the new school, like rapper Action Bronson and Robert Glasper. It was a room full of people who really didn't give a s--- whether the guy took his shirt off or not — that's not what this was about. When Questlove asked us to show D'Angelo love, we did it with all our hearts. The little most of us know about D'Angelo and his long-awaited next record comes from Questlove. He has described the Voodoo sessions as years of studying and practicing brilliant albums — Prince's Parade, Funkadelic's America Eats Its Young, Sly and the Family Stone's There's A Riot Goin' On — and Monday night replicated that process. "What I wanted to do was recreate a moment," said Questlove opening the show. "Because this is pretty much the recording process of how half of this stuff gets made when I'm involved with it. We just jam and see what happens." So this performance was an intimate window into a process previously hidden not only by D'Angelo, but by most artists. As listeners we are familiar with songs, but rarely songwriting; we know music, but not how it got there, not the series of artistic decisions and influences that bring an idea to form. To hear Questlove and D'Angelo cover The Ohio Players, Curtis Mayfield, Funkadelic and Prince juxtaposed with the songs — old and new, honed and rough — that sprung from them was to view their creativity in a raw and rarified form. And that D'Angelo, with us again, would be the artist to bare the passion and freedom of his songwriting was as unlikely as it was fitting.